The purpose of this session is to offer small business subcontractors an opportunity to meet with the potential awardee large business General Contractors for Construction Contract 3 for the U.S. Department of State, Foreign Affairs Security Training Center (FASTC). Please note: Access to the Small Business Networking Session will require presenting identification (valid driver’s license) at the Fort Pickett main gate. The Officer’s Club is located in the same building as the Nottoway County Planning Office. The ShopLocalVGA Site is growing with new merchants being added weekly. Now you can shop local, from the comfort of your couch. Virginia’s Growth Alliance (VGA) is giving small businesses the opportunity to get noticed –online, while giving consumers more options to Shop Local. Understanding that many localities and small businesses within our rural region aren’t able to develop and maintain a professional website, the VGA has launched an online e-­‐commerce site and business directory, free of charge, to supplement existing websites or even be used by some businesses and localities as their primary online presence. Participation in the ShopLocalVGA.com online store is free of charge (except for associated credit card fees which will be deducted automatically by the merchant services providers. Micro Loan Program now available! Great news for entrepreneurs looking start a new business or expand their current business! VGA is launching our new Pack Fund micro loan program, through which you can borrow up to $40,000 at low interest rates. Whether you're looking to buy new equipment, launch a new product line, or just grow your business, the Pack Fund is a great opportunity for those who may not be able to get a bank loan. A limited number of loans will be made, so don't delay in applying! The Mid-Atlantic Advanced Manufacturing Center is a 1,545-acre megasite offering a central position along the eastern seaboard of the United States. With I-95 frontage, CSX main line rail access and a direct route to Virginia ports, the site boasts easy access to both national and international markets via road, rail, and sea. MAMaC is the only megasite in Virginia, North Carolina or Maryland certified by McCallum Sweeney Consulting; no other industrial site can combine this certification with Virginia's superlative, award-wining business climate. 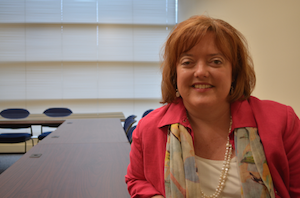 Sheri McGuire is the executive director of Longwood Small Business Development Center. She has helped craft the curriculum for Virginia’s Growth Alliances UpStart Entrepreneur Bootcamp and also is a facilitator during group sessions. 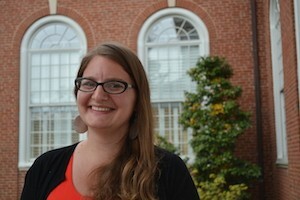 Through the SBDC, she provides follow-up mentoring and guidance to students when the bootcamp is completed. How is UpStart different from other courses designed to help entrepreneurs? In the past, the course had been taught in the traditional classroom style. The focus was on writing a business plan. There was a textbook and lectures. Southside Virginia Community College recently awarded its 20,000th Career Readiness Certificate (CRC) becoming the first member of the Virginia Community College System to reach the benchmark. The recipient was Isaiah Godfrey, a rising senior at Prince Edward County High School, who scored at the platinum level. Virginia’s Career Readiness Certificate (CRC) is an assessment-based credential that gives employers and career seekers a uniform measure of key workplace skills. The WorkKeys system was developed by ACT (formerly American College Testing) to meet the demand from business and industry for a reliable screening tool that could help employers identify the best candidates based on the work-related skills needed to be successful on the job. A lot has changed since Mecklenburg High School students first started school. In the beginning, they could walk freely in and out of buildings. Almost anyone could visit at any time. But, schools have had to take steps to increase student safety. Now students have to scan a badge to get in and out of buildings, while visitors must use a buzzer at the school entrance. In a Biz Venture Entrepreneurship course being taught at Mecklenburg’s two high schools this year, students are creating their own businesses. Real businesses, with the opportunity for investment and growth beyond the classroom..
“We hope to make a difference,” says Noah, a junior at Park View High School. He and his team of fellow students think their particular business idea has the potential to save lives when the badges and buzzers fail. Six months ago, former first-grade teacher and baking enthusiast Maria Hamilton wasn’t sure she wanted to be in business. Several years before, she’d left Cumberland Elementary School when she had her first child. 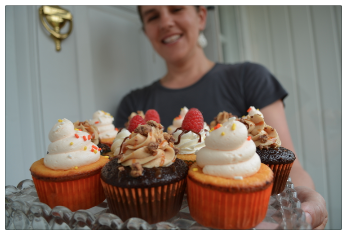 Maria went from taking cupcakes to her children’s classrooms to baking wedding cakes. Soon, as friends started asking her to bake sweets for them, Maria’s hobby began supplementing her family’s income. She created a Facebook page and before long she had big clients, like Centra Southside Community Hospital, that used her for special events. New Issue of The Virginian! 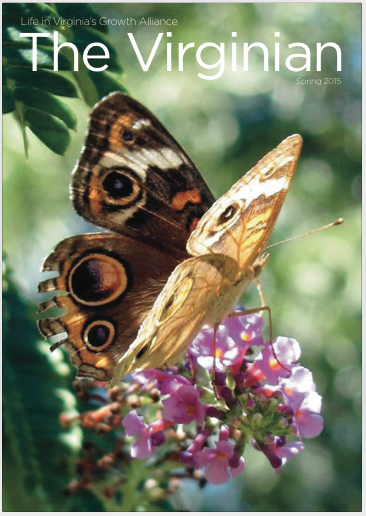 Check out the latest issue of pdf The Virginian Spring 2015 .. It's full of information about life in the VGA! Dr. Nicholas Langlie, known to many as Nick, is the creator and lead instructor for UpStart Entrepreneur Bootcamp offered by Virginia’s Growth Alliance (VGA). The second bootcamp is scheduled to start mid-May and is open to any aspiring business owners living in the VGA region, which includes Amelia, Brunswick, Buckingham, Charlotte, Cumberland, Greensville, Mecklenburg, Nottoway, Lunenburg, and Prince Edward counties, and the City of Emporia. 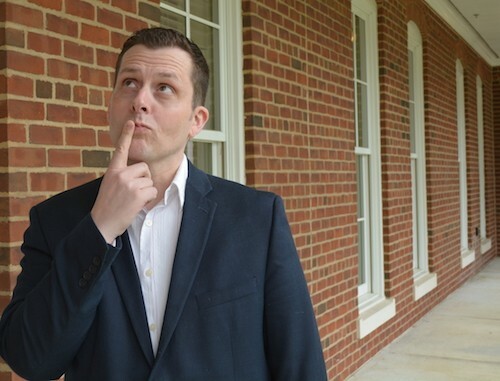 Nick is currently the Director of Innovation and Entrepreneurship (DIE) at Longwood University. He still chuckles about the acronym. What’s the biggest thing you hope students learn during UpStart? LaTreasa Early has always had a gift for teaching. Although she currently works for the federal government helping adults earn their GED or high school diploma, her true love has always been early childhood education. 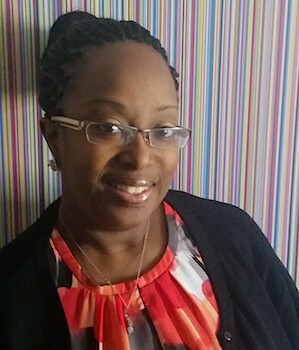 “It has always been a passion of mine” says LaTreasa who holds two Master’s degrees, one in Education from Trinity University and one in Educational Leadership from George Mason University. Now that passion is bringing her home. Born and raised in Keysville, Virginia, Latreasa is working to open a preschool based in Charlotte County for the area’s youngest learners, from 6 months to four years old. A year ago, Ilsa Loeser had the distinct feeling that something was missing. Despite a successful job as a reporter at The Farmville Herald, where her work garnered her both state and national awards, she knew what she loved most was telling stories. “There were all these people in the community that were doing good and interesting things and no one was telling their stories,” she says. Although The Herald covered many of them, between budget discussions, crime reports and house fires, reporters didn’t have enough time to capture them all. And since the people doing good were equally pressed for time, many powerful stories were simply not being told. That’s when Ilsa decided to start her own business. Austin Newsom always knew there was a need for an independent diesel mechanic in the Charlottesville area, even at the age of 17. That’s when he bought his first diesel truck and, like vehicles are wont to do, it broke down. Now, at 26, he’s ready to start his own shop. For the past 4.5 years he’s been the in-shop mechanic for Foster Well & Pump Company, located in Earlysville, near Charlottesville, Virginia. 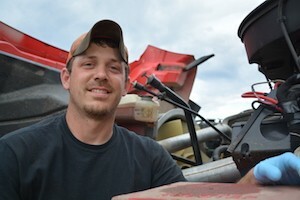 With a certification in diesel and automotive repair and nine years experience, his weekends are already filled with side work on Jeeps and diesel vehicles. GREENSVILLE COUNTY, VA - Governor Terry McAuliffe announced today (March 16, 2015) that 510nano Incorporated, a developer of renewable energy projects and technologies, will invest $11 million to relocate its headquarters and establish a manufacturing operation in Greensville County. The company will construct a 100,000-square-foot manufacturing facility for the production of solar panels in Greensville County Industrial Park. The project will create 113 new jobs. Newly revamped, powerful marketing workshop series! Each workshop will focus on a different social media topic AND a different marketing concept. These workshops are sponsored by Virginia's Growth Alliance for businesses in our member communities (counties of Amelia, Brunswick, Buckingham, Charlotte, Cumberland, Greensville, Mecklenburg, Nottoway, Lunenburg, & Prince Edward, and the City of Emporia). One outstanding participant AND their VGA member community will win $750 in free design services - that's $1500 total! 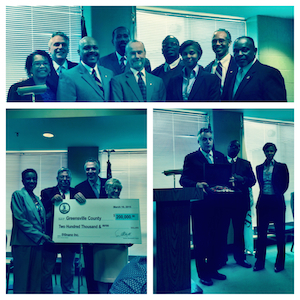 RICHMOND - Governor Terry McAuliffe announced today that Blue Ridge Railcar Repair LLC (Blue Ridge), a subsidiary of Patriot Rail Company LLC, will invest $2.41 million to expand its operations in Charlotte County. Virginia successfully competed against Louisiana for the project, which will create 37 new jobs. 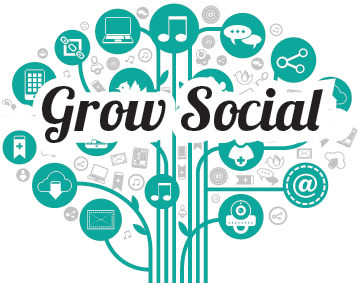 VGA is kicking off a new free marketing workshop series, GrowSocial, in South Hill on Thursday, September 18 at 6:30pm. The same workshop will be presented in Farmville on Thursday, September 25 at 6:30pm. 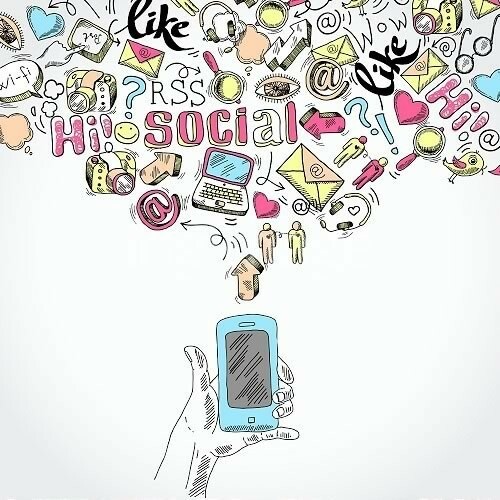 This first workshop of the GrowSocial marketing workshop series will be an overview of the major social media outlets, explaining what each is, how they differ from each other, what they're used for, and how they can be used together in a coordinated way. We will also give an overview of Longwood SBDC's new UpStart entrepreneur bootcamp. Along with these topics, an overview of other new entrepreneur initatives of VGA will be presented with a discussion on how to get your small business involved. Topics covered in the series will include Facebook, Twitter, LinkedIn, Pinterest, YouTube and other social channels; using blogging and newsletters in coordination with social media; and how to utilize the VGA’s new Shop Local website to sell online. The VGA is launching a business empowerment initiative we like to call, Think Bigger. The initiative combines a series of bootcamp-style entrepreneurial training courses with social media marketing workshops, and is designed to promote entrepreneurial thinking by providing a wealth of business and marketing resources and training to local entrepreneurs and existing small businesseses. 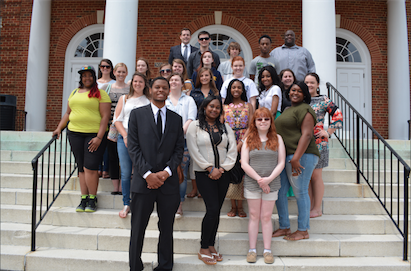 UpStart, (entrepreneurial training), is offered in partnership with the Longwood Small Business Development Center and Longwood University. With both face-to-face and online components, the series will be designed for students to be able to learn most of the subject matter interactively and online, prior to class time, so that the face-to-face and live experiences will focus on hands-on application with real world experts. Companies from all around our region will be on hand to MEET YOU! The Job Fair is open to all job seekers. Free admission. Dress to impress and bring plenty of resumes! This could be your chance to land the job of your dreams, so come prepared to show companies why you're who they need. 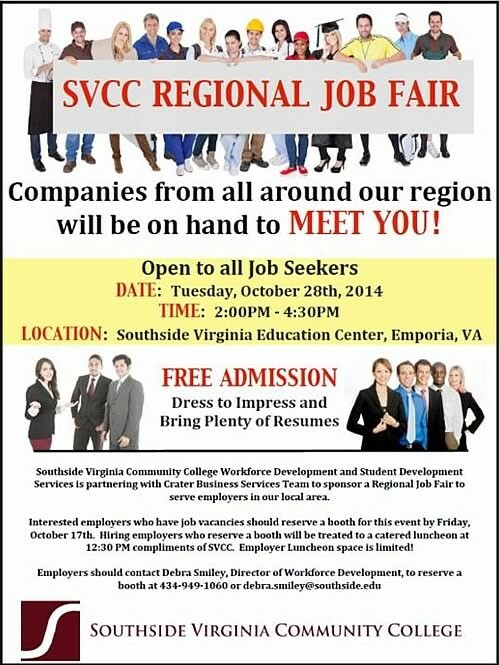 Tuesday, October 28 from 2pm until 4:30pm at Southside Virginia Education Center in Emporia. SVCC Workforce Development and Student Development Services is partnering with Crater Business Services Team to spons a Regional Job Fair to serve employers in our local area. Interested employers who have job vacancies should reserve a booth for this event by Friday, October 17. Hiring employers who reserve a booth will be treated to a catered luncheon at 12:30PM compliments of SVCC. Employer luncheon space is limited! Employers should contact Debra Smiley, Director of Workforce Development, to reserva a booth. Phone 434.949.1060 or email debra.smiley@southside.edu. Overview: A one hour information and question & answer session on the grant program guidelines, funding priorities, evaluation criteria, and application process for the Virginia Tobacco Commission’s Research & Development Grant Program. Targeted sectors for R&D grant awards include chemicals and materials (i.e.  nano-materials and biopolymers), information technology services (i.e. health IT, cyber security), biomedical and health care (i.e. point-of care diagnostics, computational technologies), energy, and clean energy & environment. Grants ranging from $250,000 up to $2 million are available for final stage of research or prototyping of new products or services that are expected to lead to commercialization. Projects must provide for at least a 1:1 match. Activities proposed for funding and the resulting commercialization must occur within Virginia's Tobacco Region footprint in order to be eligible. The next R&D grant application deadline is October 17, 2014.
Who Should Attend: Private companies, entrepreneurs, and prospective project sponsors and project team members. *2:00 to 4:00 PM - Time slots (30 minutes) are available on assignment for individual project team meetings for those planning to submit R&D applications. Location: “The Mill Room” within Virginia Heartland’s Commonwealth Regional Council building at One Mill Street, Farmville, VA 23901. RSVP to Ben Dawson, benjamin.dawson@tic.virginia.gov or 434-432-3042, by the close of business on Friday, September 5, 2014. Space is limited. This information session is offered by the Virginia Tobacco Indemnification and Community Revitalization Commission in partnership with Virginia’s Growth Alliance, Mid-Atlantic Broadband Corporation, and Genedge Alliance.